We love it when a movie is quotable. We love talking to friends, and realizing that they just said "Has this toothbrush been approved by the American Dental Association?" It is so great. Then sometimes the movie has another movie inside of it, and that movie is super quotable too! Have you ever been talking to your brother when he says someone he knows has an "ugly, yella', no-good keister"? We sure have. 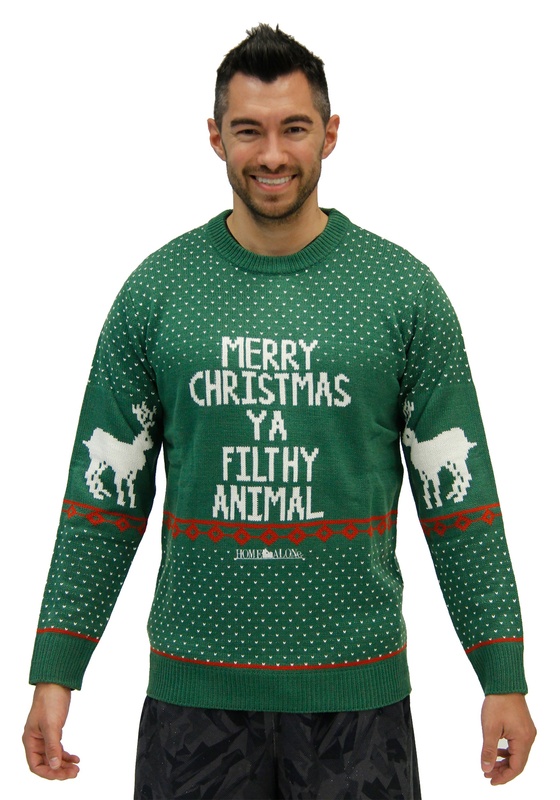 This Christmas walk around with the most quotable line from a movie inside of a movie with this Home Alone Green Merry Christmas Ya Filthy Animal Sweater. (Jeez Louise, our minds just melted a little writing that sentence.) You'll be able to have an awesome time with your friends quoting Home Alone, and the movie inside it: Angel's With Filthy Souls back at you!